Serenity Beach is 10 km away from Pondicherry, perfect to enjoy solitude, sun, sand and surf. Serenity Beach gets its name from the beach resort of the same name. 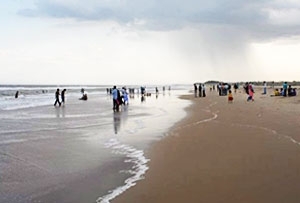 The original name is Kottakuppam beach or Thanthirayan Kuppam beach. 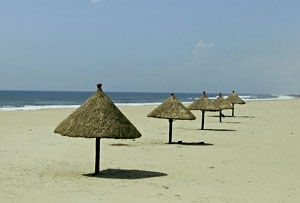 Serenity Beach as its name suggests is a tranquil spot along the Bay of Bengal. Beautiful and scenic, the name is very apt for this beach. Bathed in warm golden sand with a trail of rocks leading to the sea, it is perfect for calm days. 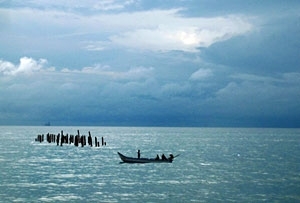 Fishermen are seen thriving here early in the morning. Their boats and gear spread over the beach. The quiet stretch is a paradise for honeymooners. Since the beach is not very popular yet, it is isolated and peaceful. The beach lies only 10 minutes from Pondicherry. It is accessible from the town. Serenity Beach is a good location for a tranquil beach stay. The sandy shores offer several sea-facing home stays and boutique hotels. Rent out accommodation choosing from the lavish options of stay. Serenity beach has no such stand out attractions. Its calm sandy stretch is its biggest allure. Isolated, less crowded it offers quietude one seeks on a holiday. Walk the sandy stretch. Watch the waves. Soak the pleasant ambiance. Food shacks, cafe and a flea market are nearby. 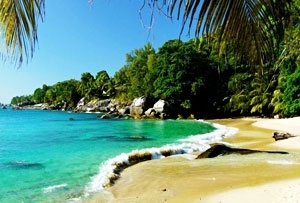 Apart from the blissful setting, serenity beach is blessed with huge waves. Surfing is very popular here. The waves are bigger than the adjoining Auro Beach. When swimming on this stretch of sand, stick to the shoreline. A surf school offers courses and gear to capture the waves. Bothe beginners and professional can try out the water sport.